Beware Greek Bearing Gifts – Yanis Varoufakis. 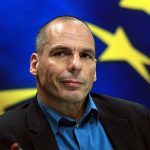 Yanis Varoufakis recently launched the ‘Democracy in Europe Movement’ , aiming to reform the current European Union by persuading it to be democratic. Varoufakis says that it is better to “work within” the EU to fix it, rather than leaving, as proposed in the UK’s #Brexit referendum and as demanded by an increasing number of Europeans. He says that leaving the EU would encourage dangerous right wing/fascists trends. We think Varoufakis is wrong and that his idea serves the ruling elite of the EU. By implication, Varoufakis is saying that we might regard the EU as saving us from ourselves, that without them we would descend into madness. By mass protest movements that have emerged in recent years, like our own struggle against the imposition of water charges. By changing voting patterns; people are moving away from traditional Party politics and supporting platforms opposed to the austerity demanded by the EU/ECB/IMF Troika. Greece was an early example, the people elected a Government committed to throwing off the shackles of odious debt. Varoufakis was a leading member of the resulting government and shouted loudly that the people’s demand would be satisfied – they entered ‘negotiations’ with the Troika accordingly. But Syriza had no plan. Despite several months in which to prepare for ‘negotiations’ all they came up with was to ask for mercy – a “please sir, may I have some more?” – begging some relief from an impossible payments schedule. But the bully that is the Troika said NO! The world watched and hoped that Syriza would stand the ground and defend the livelihood of the Greek people. When the matter was put to referendum the people confirmed the mandate given when they elected Syriza – they voted to reject the ‘deal’. Syriza ignored the referendum result, saying they had no alternative, claiming that the Troika had, in effect, carried out a coup d’état – Syriza surrendered. They could have prepared for implementing an alternative currency, they could have had emergency measures to control the banks and capital movements, they could have called for #Grexit – but they didn’t, they yielded to the bully. So Varoufakis resigned, saying he disagreed with the terms of the Troika. He made no outright condemnation of ‘his friend’ Alexis Tsipras, he provided no leadership to the people. Varoufakis just walked away “into the night”, there was no fight about this crucial issue for Greece. Recently the ECB’s Quantitative Easing programme has been boosted to printing €80 billion every month, adding to the money supply in an effort to kick-start economic growth. At the same time they have reduced their lending rate to minus levels (-.04%), the ECB is paying banks to borrow money. The ECB strategy is not working and increasing numbers of people have no confidence. The secrecy surrounding the negotiations on TTIP have added more concerns as to what direction the EU is taking. With #Brexit, the debate about Europe continues at a pace and Mr. Varoufakis has joined in by writing a ‘Letter to Britain‘ urging them to stay in the EU. Don’t leave the EU – try to reform it instead. Don’t talk about national rights – that will only encourage right wing extremists. If the EU breaks up there will be a divided Europe and a decent into fascism. Therefore we NEED the EU to save us from ourselves. Of course, this message is shrouded in talk of democracy, putting sugar on the medicine. The logic is the same as telling a slave not to leave his master, as who would feed him? Like an imperial power telling the colony that they’d love to withdraw, only that the subject people are not capable of ruling themselves. Varoufakis walked away from the commitment he gave to the people of Greece, he abandoned them to the ravages of the Troika, supervised by ‘his friend’ in Syriza. Now he has good advice for the rest of us?! He is the classic Trojan Horse, a Greek bearing ‘gifts’ which aren’t really gifts. His ideas are to ensure the continued rule of the elite by attempting to divert or frighten people into hopeless reformism – this is not new politics, it is classic sell-out. The EU is in terminal crisis, but this is officially denied. The elite refuse to acknowledge that the King is in fact naked – he has no cloths! Varoufakis is in denial of reality, but he knows that and chooses to be. Previous Previous post: Maureen Quill tells us to SHAG OFF!